Raising funds for charity through Tutoring for Charity Trust. for is KidsCan, our latest donation to this charity being $1,400. by the Fire Station, next door to Ngatimoti School. 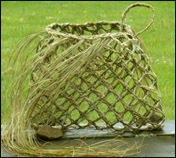 For beginners, a small 2-cornered basket, or kete, using traditional weaving techniques, similar to the smaller baskets in the front of the first image on this page. This is a versatile basic technique which can be used for a number of different projects. 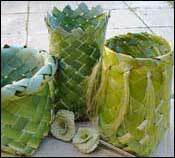 Alternatively, you can learn how to weave a large container, or waikawa, similar to the larger baskets in the third image on this page, using a different weaving technique that uses the whole flax leaf. This style has become popular as a shopping basket instead of using plastic bags. 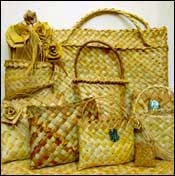 Some people manage to weave both the smaller kete and the larger one! 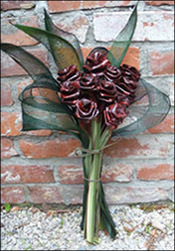 There is also the opportunity to learn to weave a couple of the simpler flax flowers. 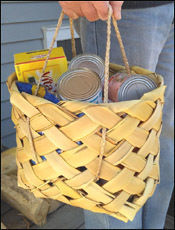 For more experienced weavers, you may like to learn how to weave a more advanced basket such as an open-weave (kupenga) basket shown in the last image on this page, or another weaving project of your choice. To secure your place in the workshop, please contact me by email or phone and I'll advise the trust's bank account to put your workshop fee into to secure your place. The price is $80 per person for the one-day workshop. I'll confirm your place on receipt of the payment. Contact me by email or phone if you have any queries. There is a limit of 10 people per workshop. Bring your own lunch and a cushion to sit on, paper and pen to take notes and some cash if you'd like to purchase my books and extra prepared flax supplies. Since 2016, the majority of the workshops I have held have been on behalf of Tutoring for Charity Trust where I've held half-day and full-day workshops raising funds for various charities of the trust's choice including KidsCan, and Catapult Employment Services Trust. © Ali Brown 2006. Last updated January 2019.